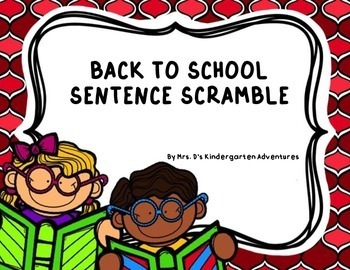 These sentence scrambles are a great way to teach students sentence structure, grammar, vocabulary and writing practice. This packet can be used for Word Work, Writing Center and Independent Work. My students love working with the sentence scrambles. 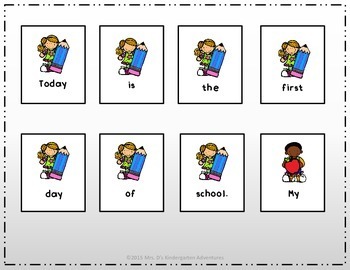 It can easily be adapted for Kindergarten, 1st and 2nd Grade, ESL and Homeschoolers. My new teacher is very nice. I love to go to P.E. Why do we have to get homework on the first day of school? 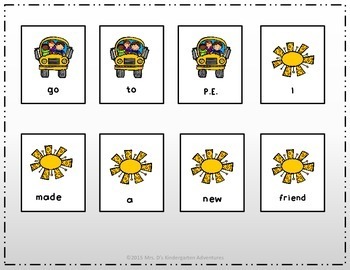 Sentence Scrambler: Laminate the pages and cut out each card. 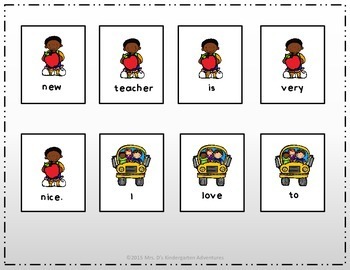 Shuffle the cards and have students re-arrange the cards by picture to make the sentence. Once they have correctly assembled the sentence, have them write the sentence next to the matching picture on the paper provided.